An estimated 1.4 million dollars was saved by the state of South Carolina as a result of the efforts of Beach Sweep/River Sweep site captains and volunteers from 1988-1998 (1998 Watchdog for the Taxpayer's Award). The S.C. Department of Natural Resources (SCDNR) has once again partnered with the S.C. Sea Grant Consortium to host the 28th Annual Beach Sweep/River Sweep from 9 a.m. to noon on Saturday, Sept. 17. 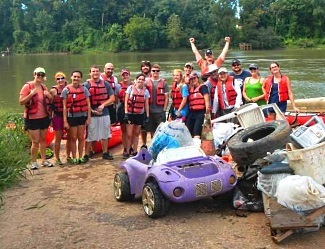 This event, South Carolina's largest one-day litter cleanup of beaches, marshes, and waterways, is hosted in conjunction with the Ocean Conservancy's International Coastal Cleanup. The event is open to people of all ages, including families, school and youth groups, civic and conservation clubs, and businesses. Volunteers can organize their owns teams and cleanup sites or they can sign up to help in specific cleanup locations in different counties. Last year, more than 4,500 people removed nearly 32 tons of litter from areas around the state. More than 1,200 tons of litter have been collected throughout the event's 27-year history, and much of that litter has been recycled.